A challenge to raise $1 billion in commitments of funding for affordable housing in the D.C. metro area was issued by a coalition of nonprofits and private corporations on March 20. The Housing Leaders Group of Greater Washington will encourage the commitment of $500 million in private capital and $500 million in public funds by the end of 2020, according to a press release. “The Capital Region Housing Challenge is a down payment toward the investments needed to truly solve the region’s housing needs, especially for lower–income residents,” said David Bowers, an executive with the nonprofit development firm Enterprise Community Partners, in a Housing Leaders Group press release. All commitments must go towards the construction or preservation of housing for households earning up to 120 percent of the area median income, a number set by the U.S. Department of Housing and Urban Development used to determine eligibility for housing assistance programs. For a family of four, 120 percent the AMI in 2018 was $140,650. The Housing Leaders Group will not be collecting the funds themselves during the challenge. Instead, the group is trying to highlight and direct investors to existing projects in the region. They will track these commitments and provide the first progress update June 11 at the Housing Association of Nonprofit Developers’ annual meeting. 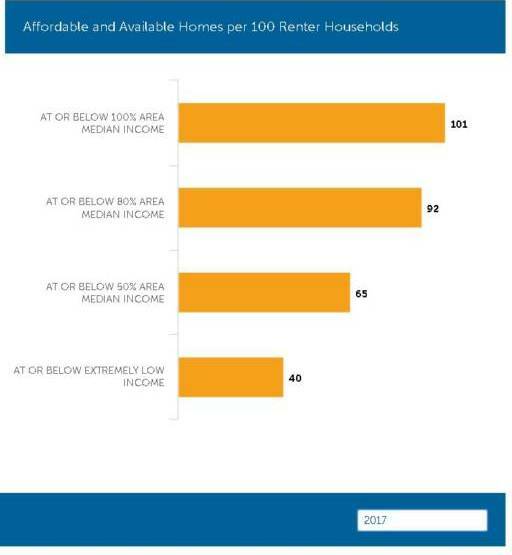 A graph from a report by the National Low Income Housing Coalition on the available number of affordable housing units in D.C.